It has been simply ages since I last wrote about the spiritual and temporal guides to my career, my “Patrons of writing and teaching” series. It’s not for lack of content (in addition to this post, I have several others in my pocket for later), but I got quite sidetracked by the writing itself, which I suppose means my mentors and muses have done their job well. Anyway, I was scouring my photo files this week for a project I’m working on, and I remembered I’d taken a handful of photos of my college professors (or, more accurately, photos of photos) while in Texas last spring, with a mind to putting them in a post just like this one. I love tracing academic and creative lineages (I wrote one of my doctoral exam answers on tracing influences from author to author in American short fiction), and I make no bones about the admiration I feel for my own teachers and influences. Today, in particular, I want to focus on one of the handful of professors who most impacted my writing as an undergraduate student at Schreiner University (then, College) in Kerrville, Texas. 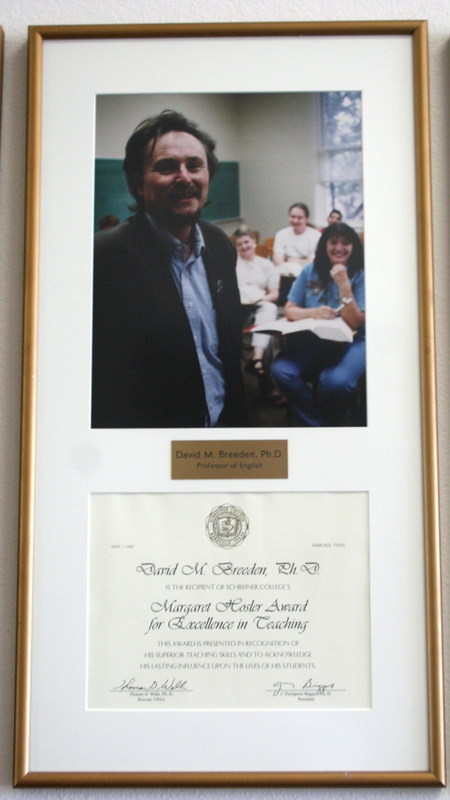 Dr. David Breeden, back when he taught at Schreiner University. When I was in Texas last spring, I knew it would likely be my last visit for a while, so when I had some free time, I made a kind of pilgrimage up to the old alma mater to nose around a bit. While there, I discovered that a few of my professors had won the university’s award for teaching excellence, which is the series of photos I snapped that prompted this post. Among these was David Breeden, one of my English professors, who was hugely supportive of my writing and who served as my undergraduate thesis director (I wrote a novel, a comedy about two morons, which my father loved so much he still insists I clean it up and publish it somewhere). the trick of switching forms as a way to change your perspective during revision: he was in the habit of changing his novels into screenplays and then back into novels just to tighten up the prose; he also changed his screenplays into novels and then rewrote them as screenplays to better develop characters and plot . . .
And a myriad of other things. Breeden also encouraged me as I produced a couple of (really amateur) chapbooks in college, stepped up as an advisor for our student newspaper (I was an editor), supported our chapter of Sigma Tau Delta (the English honor society), and got me involved in the Texas Association of Creative Writing Teachers and the Gulf Coast Association of Creative Writing Teachers — when one of my short stories won an undergraduate fiction award from GCACWT, it was Breeden who collected the award for me at the conference and presented it to me during one of my classes! But perhaps his biggest influence on my career wasn’t what he taught me about writing, but what he taught me about academia. I once asked him why, with all the writing he did, he had chosen to teach college rather than write full time. He quipped that teaching was the best way he could figure out to stay in school and “not have to get a real job.” It was the former part of that joke that appealed to me, because at the time I was just discovering how well suited I was to higher education and academic life, and while I’d entered college with the idea that I would teach high school, I decided then and there to pursue my education through my PhD and teach college, because while even then I knew how much of a “real job” teaching actually is, I was absolutely besotted with the idea that I could stay in college for the rest of my life. Rev. 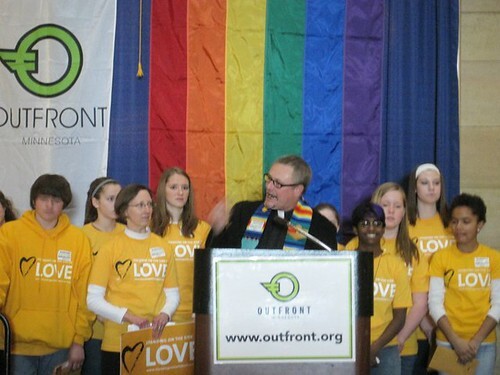 David Breeden at a Minnesota Faith Rally in February 2011. Photo from Flikr, by "StandingontheSideofLove." More directly, Breeden and his cohort (and my next Lineage post) William Woods, were instrumental in helping me find my place in the masters program at West Texas A&M University, where I worked with (future Lineage post) Jerry Bradley, who introduced me to author (and subject of my masters thesis) Tom Franklin. . . . You see what I mean about the importance of tracing a lineage? Breeden, I should point out, has since left academia to pursue another passion of his — religious philosophy — and after attending seminary, he currently serves as a Unitarian minister and writes religio-philosophical poetry and essays while also fighting for social justice and equality. We remain good friends, and I continue to learn from him.